"No need to chop, process or grate. 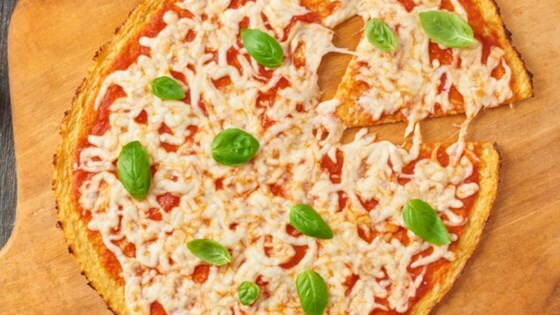 Start with a bag of our Riced Cauliflower to make this easier than ever pizza crust. Bake, then top with all of your favorite pizza toppings. Who knew eating veggies could be so much fun…and delicious?!" Microwave Green Giant Riced® Cauliflower according to package directions. Drain cooked cauliflower in a colander, pressing out as much moisture as possible with paper towels. Stir in egg and cheeses. Spray baking sheet with nonstick cooking spray. Press cauliflower mixture into an 11-inch circle. Bake 25 minutes or until edges are brown and crust is crisp. Top with desired pizza toppings. Bake 8 to 10 minutes. Bring your holiday party to life with delicious bite-size appetizers. I would make again, but next time use 2 bags of riced cauliflower. I got my pizza fix w/o blowing my diet. Used a little garlic and onion powder.